The JST male and female connector set is great for low Amp applications, powering cameras, First Person View systems or any other item that needs to be removed from your system from time to time. 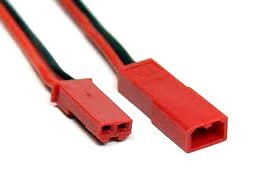 The connectors have a key to prevent incorrect connection, so you will not be able to reverse the power supply to your equipment, these small light weight connectors are a must have part on systems where space is tight and you need to remove items quickly without needing to de-solder connections. Suppled is one male and one female JST connector with 100 mm wires.